This is a branch of the family of CHRISTIE, of Dundee. Marion; Sarah; Maria; Anne Wakefield; Sarah Edith; Jean Goff; Gertrude; Ethel. ALEXANDER REGINALD WAKEFIELD, of whom hereafter. ALEXANDER REGINALD WAKEFIELD (1902-84), of Moyallon, High Sheriff of County Armagh, 1950, married (Edith Cecilia) Marianne, daughter of the Rev Hugh Edmund Boultbee. MOYALLON HOUSE, near Gilford, County Down, comprises two storeys and three bays over a high basement and attic rooms. It was built ca 1795 and remodelled in 1863 by John Grubb Richardson, possibly incorporating earlier fabric. The townland of Moyallon was settled in 1675 by the Christys, who are thought to have introduced the linen trade into the area. A group of closely related Quakers settled along the River Bann between Moyallon and Lawrencetown in subsequent years, building mansion houses that reflected the increasing success of the linen manufacture and trade in which they were engaged (Rankin). A house is known to have existed on the site in 1781, when the nearby Friends Meeting House was built. A house on the present site was built in 1794 by Thomas Christy Wakefield, who had been living in another house nearby, also known as Moyallon House, which had been gutted by fire. In 1840 Moyallon House comprised cellars, turf house, potato house, stables and lofts, a coach house, byre and privy. In 1863, Moyallon was said to be "rebuilt, enlarged and new wings added to it, also neat offices and gate lodges in progress." Thomas Jackson, an architect and Quaker himself, was well known to the Richardsons, having designed meeting houses in Belfast and Lisburn, and is thought by Dean to be responsible for the gatehouses at Moyallon. John Grubb Richardson was a descendant of the Richardsons of Lisnagarvey, some of the earliest plantation settlers in the area, recorded there in 1610. 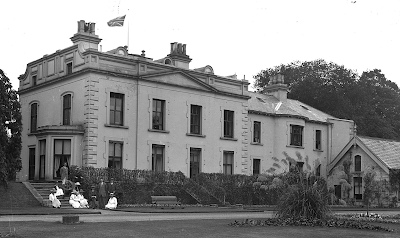 Many generations of the family were involved in the making and marketing of linen, initially in Glenmore, Lambeg and eventually in Liverpool, Philadelphia, New York, and the model village of Bessbrook. 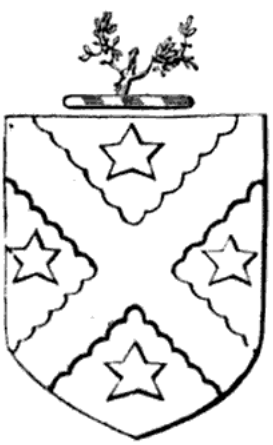 John Grubb Richardson purchased from Lord Charlemont the Mount Caulfield estate in Armagh, where his cousins the Nicholsons had already established a spinning mill. Richardson built a model village at Bessbrook from 1845, initially around spinning mills and eventually weaving factories with houses, a school, churches and a shop but no access to alcohol in accordance with the temperance practised by Quakers. In 1863, Richardson inherited an estate in County Tyrone and it is the sale of this estate which appears to have allowed him both to become the sole owner of Bessbrook works and village and to extend his new residence at Moyallon. A further gate house was added to the estate in 1871. John Grubb Richardson died in 1890, leaving his widow in residence at Moyallon House until her death in 1909. Jane Richardson had two stepchildren and seven children of her own, one of whom, Thomas Wakefield Richardson, took over the house on his mother’s death. In 1901, Mr Richardson lived in the house with his English wife, a cook and a Quaker housemaid. In 1911, Richardson and his wife were away from home but their staff had been enlarged to include a cook, lady’s maid, housemaid, kitchen maid and parlourmaid. 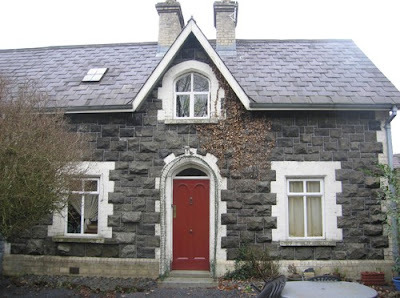 Moyallon House passed to his widow, and, as the couple were childless, in 1945 the house became the property of their nephew, Alexander Reginald Wakefield Richardson. In 1934, the ground floor of the house included a dining room, drawing room, library, morning room, flower room, cloakroom, billiards room, bedroom, butler’s pantry, servants’ hall, scullery, two kitchens, servant's bedroom, two cloakrooms, boot-rooms, three pantries and a larder. On the first floor there were seven bedrooms, a sitting room, a bathroom with hot and cold water and a WC (lavatory). On the second floor had six servants’ bedrooms, a bathroom and a box-room. The outbuildings comprised a glass-walled museum (now gone), a laundry, drying-room and loft with three servants’ bedrooms, three steam-heated greenhouses, stabling, four garages (one with two rooms over), stores and agricultural buildings. The grounds included two grass tennis-courts and a croquet lawn. Alexander Reginald Wakefield Richardson and his wife Marianne had four children at Moyallon but, in the 1940s, two of their children died of typhoid and a further child died a few years later. Because of the associations of the house with this terrible event, Alexander, Marianne and their son Hugh moved into a nearby Richardson property, The Grange. The furniture in the then vacant Moyallon House was auctioned off and the premises was leased to the Department of Health and Social Services as a residential special care school. A fine marble fireplace was removed at this period and fitted in Derrymore House, Bessbrook, a property which had been donated by the Richardsons to the National Trust. In the 1970s the house was occupied by a Mrs Mathers who ran it as a guest house, following which it was vacant for some years. In the early 1980s the house was renovated as a family home. The south wing of the house is now called ‘The Lodge’ and in the 1990s was developed into three self-contained flats by the architect William C Callaghan, of Portadown, County Armagh. As part of this development, a verandah of wood and glass that is shown on the first survey photograph was taken down and a single-storey flat-roofed extension built in its stead. The grounds of Moyallon House today extend to about 400 acres. There are mature shelter trees, with a line of stately Wellingtonias. Formal gardens and terracing at the house are presently grassed over. The walled garden, with a turreted potting-shed, is uncultivated. The head gardener’s house is inhabited. Two gate lodges were added in the 1880s to the designs of Thomas Jackson (Front Lodge and Rear Lodge).